The country home of the embattled President General of the Ohanaeze Ndigbo, Chief John Nnia Nwodo at Ukehe in Enugu State, was on Sunday rocked by bomb blast. 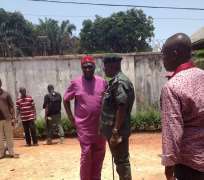 Nwodo’s leadership of Ohanaeze has been enmeshed with serious crisis for several months now. According to the Enugu State Police, the blast emanated from an Improvised Explosive Device, IED, which was thrown into his house by unknown persons from outside his compound. The explosion, which destroyed part of his building, left the the ceiling and windows of the house shattered. Media Adviser to the President General, Chief Emeka Attamah, who confirmed the attack said that the Enugu State Commissioner of Police, Danmallam Mohammed, accompanied by the Area Commander for Nsukka Police Command and the Divisional Police Officer for Igbo Etiti LGA, were there to inspect the scene of the blast which created a crater in the compound. Addressing the people who tripped to Chief Nwodo’s home, the Commissioner enjoined them to always be vigilant and to report any strange faces to security operatives. Danmallam who described Enugu State as very peaceful, wondered why some miscreants would be after the life of Chief Nwodo who he said is only serving his people. He added that what happened was a sign for the need for greater security around him. The Commissioner ordered that security be beefed up in and around Chief Nwodo’s compound and promised that the perpetrators would soon be identified and brought to justice. Earlier, the Commander of the Bomb Disposal Unit, DSP John Aniche, had briefed the Commissioner and Chief Nwodo on the items they collected from the scene, including batteries, pellets and other materials used in preparing the IED. He said that they would be carefully scrutinised and analysed. Meanwhile, Nwodo has expressed surprise that anybody would be after his life but added that the incident would not deter him from leading his people. In his speech, he had thanked the Commissioner of police for his prompt response to the incident. Also speaking, the traditional ruler of Umudele in U kehe, Igwe Lawrence Aroh, thanked God for saving the life of the President General. The monarch wondered why some bad elements would constitute danger to others in a country bountifully endowed by nature. He assured the Commissioner that the people would be extra vigilant and that any such attempt in the future would be nipped in the bud. The Enugu State Director of DSS, Mrs E A Likiyon, was also at the scene.